We’re here to showcase one of our finest providers of men’s sweaters. With roots in Peru, Enrique and Patricia Rodriguez-Pastor always wanted to bring Peruvian fabrics and garments to the rest of the world. 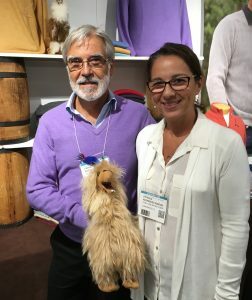 For more than 25 years, Enrique and Patricia have worked to manufacture, market and sell their unique products. They believe that there truly is no competition because of the exclusive level of quality and detail put into each garment. Peru is well-known for their excellent quality of alpaca fiber and Pima cotton. Alpaca fiber is recognized for its durability, softness, and ease of wear. Alpaca sweaters are not bulky or heavy, but they still offer warmth. The versatility is such that their sweaters could be worn throughout the year. Our designs feature only the best quality fibers, a distinction from many other companies that may use poly-blend fabric for convenience and affordability. We offer classic sweaters in baby alpaca and royal alpaca. Most colors are available for endless possibilities and sizes range from small to XXXL, although availability may vary. We offer unique style and unparalleled quality in our garments. You will not want to miss purchasing an Executive Image Alpaca sweater for the upcoming winter.